Benjamin Weaver, the quick-witted pugilist turned private investigator, returns in David Liss’s sequel to the Edgar Award-winning novel, A Conspiracy of Paper. Moments after his conviction for a murder he did not commit, at a trial presided over by a judge determined to find him guilty, Benjamin Weaver is accosted by a stranger who cunningly slips a lockpick and a file into his hands. In an instant he understands two things: Someone had gone to a great deal of trouble to see him condemned to hang — and another equally mysterious agent is determined to see him free. So begins A Spectacle of Corruption, which heralds the return of Benjamin Weaver, the hero of A Conspiracy of Paper. After a daring escape from eighteenth-century London’s most notorious prison, Weaver must face another challenge: how to prove himself innocent of a crime when the corrupt courts have already shown they want only to see him hang. To discover the truth and clear his name, he will have to understand the motivations behind a secret scheme to extort a priest, uncover double-dealings in the unrest among London’s dockworkers, and expose the conspiracy that links the plot against him to the looming national electionn — an election with the potential to spark a revolution and topple the monarchy. Unable to show his face in public, Weaver pursues his inquiry in the guise of a wealthy merchant who seeks to involve himself in the political scene. But he soon finds that the world of polite society and politics is filled with schemers and plotters, men who pursue riches and power, and those who seek to return the son of the deposed king to the throne. Desperately navigating a labyrinth of politicians, crime lords, assassins, and spies, Weaver learns that, in an election year, little is what it seems and the truth comes at a staggeringly high cost. Once again, acclaimed author David Liss combines historical erudition with mystery, complex characterization, and a captivating sense of humor. 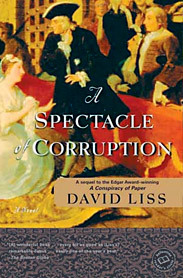 A Spectacle of Corruption offers insight into our own world of political scheming, and it firmly establishes David Liss as one of the best writers of intellectual suspense at work today.